Just back after holding the initial consultation & explanatory discussions with well-known surgeon Dr. Vikas Kunnure at the reputed Nu Hair Clinic branch in Liverpool, Mr. David Patterson felt really excited about starting the journey to make his receding hairline get back its deserving follicles. The day of the hair transplant procedure brings together with it all the inherent excitement & nervousness, as is the case for an eager David who mentally & physically prepares himself for the intricate operation that is primed to commence in a few hours at the Nu Hair Clinic (Liverpool) in UK. After spending almost an entire day at the Nu Hair Clinic in the UK, Mr. Patterson is literally tired & out of breath, since the entire process has taken a lot out of him. Yet, despite the ‘sinking’ feeling, this is what he has to say back in the comfort of his own home, “Hopefully, the results will be well worth it”. For a recovering patient like David, a pertinent cause for concern stems directly from the rashes/sores emerging on his forehead, only a few days after completing the first half of the transplant. But the advice from the staff at the Liverpool Nu Hair Clinic that it’s perfectly normal, encourages him. 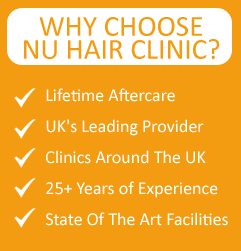 “I woke up this morning expecting to be in agony, but I was very surprised by the lack of pain; a lot less sore than I thought was going to be.” These are the words of Mr. David Patterson, as he’s going to the Nu Hair Clinic at Liverpool in the UK, for the next phase of the quite complex surgical procedure. Dave, as he’s affectionately called, is somewhat relieved that 3 days later, the swelling has reduced, and has begun appearing more on the facial muscles than on the forehead. Furthermore, he appreciates the “How things are going/how are you feeling?” calls from Marie at the Nu Hair Clinic (UK). A day before his scheduled follow-up with Dr. Kunnure and precisely 3 weeks after the treatment at the Nu Hair Clinic actually took place, David P. can proudly show off his growing hairline, duly accompanied by the fewer marks left behind due to the scabbing, a truly remarkable occurrence. With the optimism that the full output would manifest quickly, Mr. Patterson is starting to notice the increasing density of his hair after a 6 month hiatus during the procedure done at the Nu Cosmetic Clinic in UK. Still, an inevitably long journey awaited him.